Unfortunately, over the years the stability of the economic relationships based on the M2 monetary aggregate has also come into question. One such episode occurred in the early 1990s, when M2 grew much more slowly than the models predicted. Indeed, the discrepancy between actual and predicted money growth was sufficiently large that the P* model, if not subjected to judgmental adjustments, would have predicted deflation for 1991 and 1992. For example, in the mid-1970s, just when the FOMC began to specify money growth targets, econometric estimates of M1 money demand relationships began to break down, predicting faster money growth than was actually observed. Problems with the narrow monetary aggregate M1 in the 1970s and 1980s led to increased interest at the Federal Reserve in the 1980s in broader aggregates such as M2. 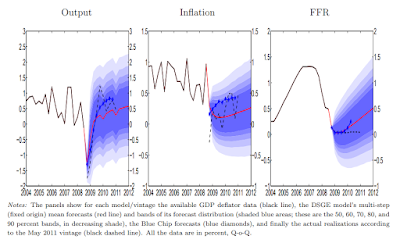 Unfortunately, forecast errors for money growth are often significant, and the empirical relationship between money growth and variables such as inflation and nominal output growth has continued to be unstable at times. Very cool! 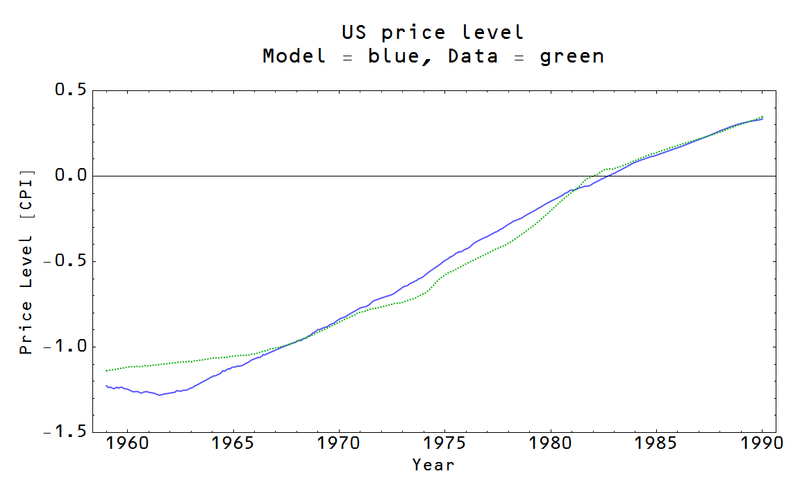 Is it possible for you to model the implicit price deflator? 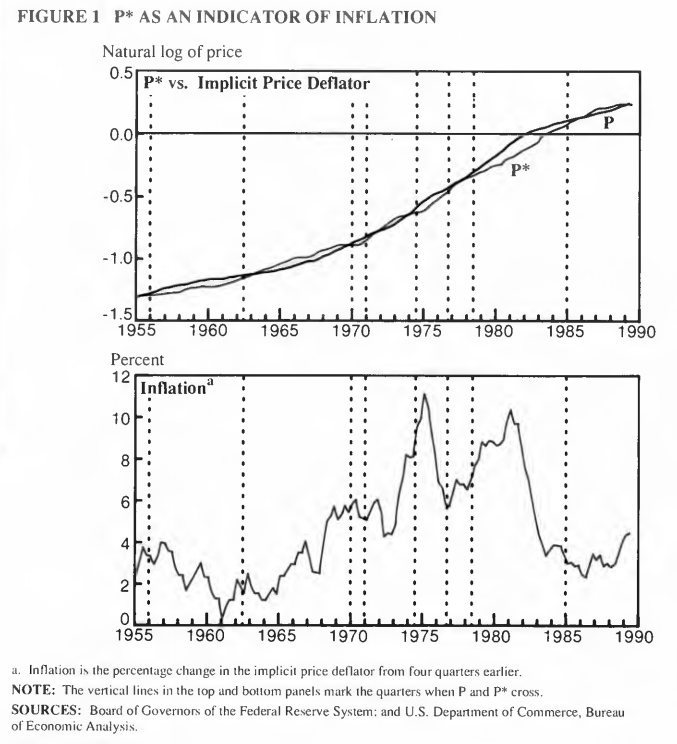 Is it my imagination, or are there noticeable differences between the implicit price deflator and the CPI? Also, do you not have data back to 1955? No, the data for CPI only goes back to 1957. For some reason I typed 1959 as the start point in the code though. I think P* used the deflator in that paper because it worked better for the deflator. 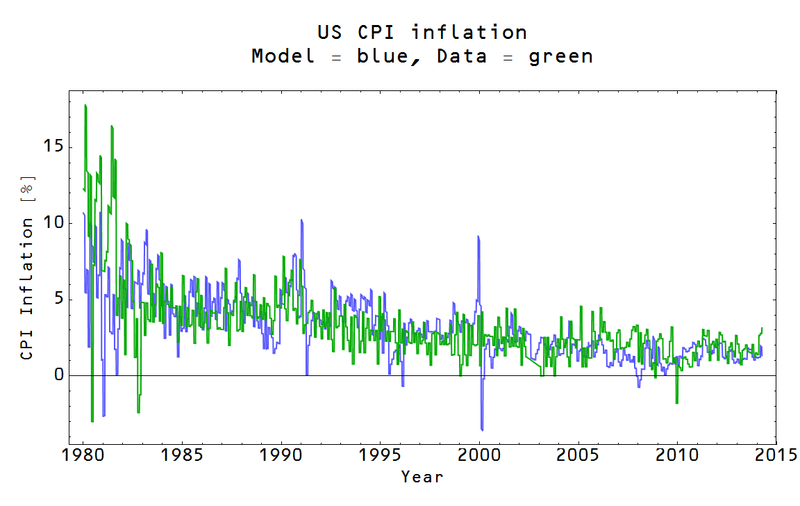 There was at least one paper out there that also fit parameters for the CPI. But like they say about arguing in economics: try to get your position to be the null hypothesis. Can the ITM be used to devise an optimal "rule?" Maybe as a country you should head towards the dP/dM0 = 0 line and then monetary policy becomes irrelevant for the rest of your economy's history? Maybe the brief period from the 70s to the 2000s was a special time when monetary policy is relevant. That actually is pretty satisfying from a philosophical and political economy perspective. Monetary policy has real effects because of money illusion -- one way to look at that is that you are tricking your populace to spend money. If monetary policy becomes irrelevant then money illusion becomes irrelevant. That's just one way to look at it (and it's dependent on the theory being correct). Actually, I wish it were the case that the MMists were right! I like the idea of monetary being able to do everything they claim it can all the time (leaving fiscal policy to concern itself with projects based only on the merit and cost of the project, rather than having to do monetary's job as well). Nick Rowe puts it as "good monetary policy should make it appear that Say's Law is true."... but you've made a good case that this is probably not possible forever. Hi, I found you from your post on MR. I'm curious what you’re doing and I’m wondering if you could write a simple explanation of your theory for people who don't know how to read partition equations and the like. I dug a bit and didn’t find any prose explanation of your ideas. Just as writing your ideas in equations forces you to be precise, I think writing them in text forces you to be rational. It might also increase your readership. I’m a bit confused by what I read because on one hand you appear to be very much a monetarist with your proposal of a mathematical link between money supply and price level, and on the other hand you are resisting the conclusion that Japan’s base money expansion has sustainably increased the inflation rate. I’m with you on Japan, but not on the mathematical link between base money supply and prices. Generally I’m with Kalecki that monetarism is "the science of confusing stocks with flows." That is, I think prices are determined by flows of spending versus production, not by stocks of money supply. Take for demonstration purposes two extreme examples: the US 2012-2013 and Russia 1993-1994. Both were increasing their base money supplies, albeit Russia much more quickly. The US was doing so for monetary policy reasons, not to fund public spending, the rate of which was nearly flat. Russia was doing so to fund extremely rapid increases in nominal public spending, and chasing the inflation that resulted. US inflation was low and stable. Russia experienced hyperinflation. The difference was not a matter of scale, but of total lack of additional inflation pressure in the US versus extreme inflation in Russia. 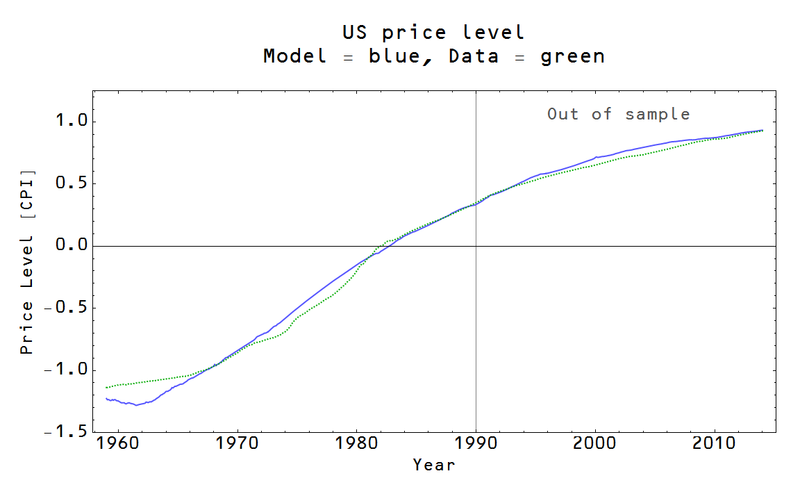 I submit that any model that mathematically links consumer prices to base money supply will not be able to explain why the US experience differed completely from Russia’s. On the other hand, the difference is easily explained by their differing trends in public spending. I’m not saying the monetary base is irrelevant to private spending, but the relationship is I think not a consistent formula, and it’a of tiny importance relative to the question of whether base money expansion is or isn’t funding fiscal expansion. You also positively referenced Williamson, suggesting you endorse his theory that in a base money expansion, “to induce people to hold more currency, its return must rise, so the inflation rate must fall.” It seems obvious that instead currency’s value falls against alternative assets, but against different alternative assets in different situations – eg FX was of major importance among alternative assets to yen currency in Japan’s QE, but only of minor importance among alternative assets to dollar currency in US QE. Thanks for your thoughtful comments, Tom. Regarding Russia, I will look into that case in a future post. Regarding Williamson, I don't necessarily agree with his entire thesis. When he suggested that monetary expansion could be deflationary, though, I was somewhat ... Relieved? My model had predicted the possibility and used it to explain Japan. It was interesting to hear such a possibility suggested by an actual economist. Regarding the different behavior under similar monetary expansion, the information transfer model has a changing "information transfer index". When the index is low, you get "quantity theory of money" behavior. When the index is high, you get more ISLM model or even liquidity trap behavior. Argentina is shown to be more consistent with hyperinflation solution, but it is difficult to say when it starts. Anyway, I try to be as responsive as I can to questions, even on older posts, so have a look around. I'm afraid though I think you're going down the wrong track with any mathematical formula relating any measure of the stock of money supply to the aggregate demand. In essence your "k" index variable seems to play the role of "velocity" - an arbitrary number called on to patch the differing trends of money supply and spending, which can't be predicted or known except by knowing money supply and spending. I'd suggest you study several hyperinflation episodes. They're all the same - exponential base money expansion funding exponential fiscal expansion. No central bank ever generated hyperinflation through private credit channels. Likewise high inflation countries are all similarly steadily increasing nominal public spending, typically funding with a majority/minority mix of base money expansion and sovereign debt. The lower down the inflation levels you go, the more important private credit expansion is likely to be in the mix. Here's a departing question: if you remove M and k from your models and substitute instead an S (spending), what do you have? If k is merely a completely unpredictable relation between M and S, undeterminable by any science other than measuring M and S, I don't think there's any material difference between a model with M and K and a model with S. The former is just unnecessarily more complicated. Regarding the spending, is that GDP measured with expenditure method? That is almost identical to NGDP as commonly reported income method (spending = income). The results are essentially the same inasmuch as GDPi = GDPe. I don't really know, but the theory works for ideal gasses, random walks/diffusion, Hubble expansion and a couple of other effects in the original paper. I would imagine it could work in all kinds of scenarios ... if there is any specification of a non-human economy out there, it would be interesting to try.